The brothers arrived in Senegal at the beginning of 1993, at the invitation of Cardinal Thiandoum, the then archbishop of Dakar. The intuition of Brother Roger was that we should establish a small fraternity of the community in a Muslim country of black Africa (officially there are scarcely 5% of Christians in Senegal) even if at that time the tensions around Islam had scarcely begun to make themselves felt in the world. 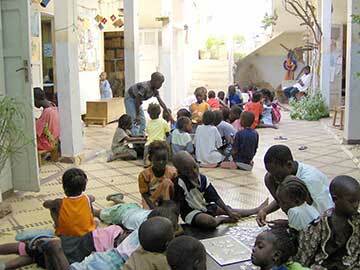 The brothers set up home in a large working class neighbourhood of Dakar, to live their community life of prayer, welcoming others, and sharing. The reception they got from the neighbours, while obviously a bit suspicious at first, quickly became warm and trusting. The house is open every day to children from the neighbourhood for activities that complement what they do in school. They are taken care of by adolescents who themselves receive support for their own schooling. The young adults also come to study and to reflect. Some of the women come to do sewing work for which an outlet has been found. According to the number and the qualifications of the brothers, there are or have been various activities involving refugees and emigrants, prisoners and people with AIDS, with particular emphasis given to the most destitute and those who are more or less marginalised. The local church has welcomed the brothers generously and they are committed in various ways: organising prayers, training programs, architecture. But the most essential remains their presence in the neighbourhood, listening and occasionally helping out with so many recurrent problems: health, work, and even survival, at a time when those who are most vulnerable feel directly the effects of the economic crisis and have reached the limit of what hey can do. The prayer together is nourished and stimulated by the fact of its being rooted in the life of the neighbourhood. It is also sustained by the faithful participation of many children, of young people and some of the adults from among the Christians of the neighbourhood. Just like every Christmas Eve, we can see a large marquee being set up at the nearby cross roads and reaching right to our door. It blocks all the traffic. People bring carpets, a platform, chairs and some armchairs for the dignitaries; and a very impressive sound system, with an electricity generator to take care of any possible overflow. The loud speakers are obviously directed in such a way as to cover the entire neighbourhood, us included. From 3 pm we can’t hear ourselves speak in our little courtyard. We are told that the aim is to organise nights of prayer and religious songs for the young Moslems! There is nothing against us. But what are we to become, with the little prayer vigil we had planned? A beautiful vigil, joyful and meditative, with children, young people and some of the mothers. Our courtyard is like the humble stable on the night in Bethlehem. When we finish around mid night, whenever the children leave the house, the loud speakers start up afresh. We will not close an eye tonight. One of the brothers writes: “There are no mountains in Senegal. Everything is desperately flat. So how can we live the Feast of the Transfiguration? By sharing, are you among those who, with very little, generate a fine human hope?